C2.1 Use appropriate terminology related to metabolism, including, but not limited to: energy carriers, glycolysis, Krebs cycle, electron transport chain, ATP synthase, oxidative phosphorylation, chemiosmosis, proton pump, photolysis, Calvin cycle, light and dark reactions, and cyclic and noncyclic phosphorylation. C2.2 conduct a laboratory investigation into the process of cellular respiration to identify the products of the process, interpret the qualitative observations, and display them in an appropriate format. C3.1 explain the chemical changes and energy conversions associated with the processes of aerobic and anaerobic cellular respiration. C3.4 describe, compare, and illustrate (e.g., using flow charts) the matter and energy transformations that occur during the processes of cellular respiration (aerobic and anaerobic) and photosynthesis, including the roles of oxygen and organelles such as mitochondria and chloroplasts. 2) Explain the chemical changes that occur in aerobic and anaerobic respiration. 4) Describe and illustrate the energy and matter changes that occur during aerobic respiration and the identify the location in the cell which these changes occur. Metabolism is the sum of all chemical reactions that occur within a cell. These chemical reactions transform matter and energy within cells in a series of sequential steps, known as a metabolic pathway. A metabolic pathway exists to break down energy-rich compounds and convert the energy into a form that the cell can use. Specific enzymes catalyze each step in a metabolic pathway, without the presence of these enzymes the reactions would not occur fast enough to sustain life. There are two main types of metabolic pathways: the catabolic pathway, which is the breaking down in compounds into smaller molecules and release energy, and the anabolic pathway, which uses energy in the cell to build larger molecules. The laws of thermodynamics play a role in metabolic pathways and how energy is transferred within a cell. The first law of thermodynamics states that energy cannot be created or destroyed, but it can be transferred from one type of energy into another. When a chemical reaction occurs energy is released, some energy is converted into mechanical energy and the rest is converted into heat and chemical energy. The second law of thermodynamics states that during any process the universe tends towards disorder, which applies to the concept of entropy (S). This law of thermodynamics applies only to closed systems, which does not include living organisms because life requires inputs of energy to decrease entropy and stay alive. The chemical bonds reduce disorder, but increase heat. There are two main forms of energy: potential energy and kinetic energy. The energy found in the cell is potential energy that has been converted into kinetic energy. In a cell the potential energy is stored as chemical energy inside of compounds chemical bonds, when the chemical bond is broken there is a release of kinetic energy in the form of chemical, mechanical or thermal energy. The amount of energy used to form or break a chemical bond is known as bond energy. When the change in free energy (∆G) is positive there is more free energy in the product of the reaction then in the reactant. These reactions are known as endergonic reactions and do not occur spontaneously, because they require an input of energy. When the change in free energy (∆G) is negative there is less free energy in the product of the reaction then in the reactant. These reactions are known as exergonic reactions and can occur spontaneously and give off energy. However any chemical reaction can proceed spontaneously if the difference in the disorder (T∆S) is greater than the difference in the bond energy between the reactant and the product (∆H). For every reaction to occur, even spontaneous reactions, there is some energy input required. This energy input is known as activation energy. The activation energy of a reaction can be decreased by using a catalyst, which are called enzymes in biological systems. In cells the energy gained from catabolic reactions is used the drive anabolic reactions. Adenosine triphosphate (ATP) is the main source of energy that is used in the cell; ATP is primarily created by catabolic reactions and is consumed primarily in anabolic reactions. ATP has high energy bonds that are created by the negatively charged phosphate groups repelling one another. A large quantity of energy is released from ATP when the bond between two phosphate molecules is hydrolyzed in a reaction, creating adenosine diphosphate (ADP) and an inorganic phosphate (Pi). Combining ADP and an inorganic phosphate to produce ATP is known as substrate level phosphorylation. The release of energy from forming ADP from ATP is used in cells to a fuel endergonic reactions and the energy from exergonic reactions are used in cells to create ATP from ADP. This process is called coupling reactions, which makes the cells metabolic pathways more efficient. A redox reaction occurs when there is a movement in electrons from one atom or molecule to another. An oxidation occurs when an electron is lost from an atom or molecule and is transferred to another. A reduction occurs when an electron is gained from an atom or molecule and is transferred to another. How are redox reactions used in aerobic respiration? Energy is extracted from glucose using oxygen to oxidize the carbon-hydrogen (C-H) bonds. This occurs in a series of steps where a hydrogen and an electron breaks away from the oxygen atom in glucose and combines with oxygen molecules to become water. The removal of the hydrogen atom and the electron causes a shift in the orientation of the electrons around the oxygen atom and carbon atom in the glucose molecule causing a decrease in the free energy in the reaction. Electron carriers transfer the electrons from high energy compounds and donate electrons to specific molecules of lower energy. Heterotrophs are organisms that feed on other organisms to obtain chemical energy. A heterotroph feed on autotrophs, as well as other heterotrophs, through a food chain. Heterotrophs include all animals and fungi and most protists and bacteria. All of these organisms use glucose (C6H12O6) as their primary source of energy. Glucose is broken down in the cells of the organism by a series of enzyme controlled, exergonic, redox reactions into carbon dioxide, water and energy. The energy is harvested from the glucose using oxygen that is in the cells. This process is known as aerobic respiration. The process of aerobic respiration occurs in 4 main stages: Glycolysis, Pyruvate oxidation, the Krebs cycle and the Electron transport chain. The pyruvate that is created during glycolysis in the cytoplasm of the cell proceeds into a process called pyruvate oxidation. Pyruvate oxidation occurs only when oxygen is available in the cell and pyruvate must be transported from the cytoplasm into the inner mitochondrial matrix to continue the process of aerobic respiration. Pyruvate is oxidized by NAD, which causes a carbon to be removed from pyruvate to produce carbon dioxide and a NADH. The remaining 2 carbon molecule, or acetyl group, becomes associated with a carrier molecule known as Coenzyme A, to form the molecule acetyl-CoA. This reaction facilitates the movement of pyruvate from the cytoplasm into the mitochondria. The Krebs cycle is nine step cyclical pathway that occurs inside the mitochondria. The Krebs cycle is known as a cyclical pathway because the molecule oxaloacetate that is required at the beginning of the Krebs cycle is regenerated as an end product. Acetyl-CoA enters the Krebs cycle by combining with the 4 carbon molecule oxaloacetate and creating the 6 carbon molecule citrate, or citric acid. Citrate proceeds through a series of three reactions, where citrate undergoes an oxidation creating one carbon dioxide molecule and one NADH molecule. In the fifth reaction Coenzyme A enters the Krebs cycle and is coupled with a second oxidation reaction to produce a 4 carbon molecule, succinyl-CoA, one carbon dioxide molecule and one NADH molecule. Step six in the Krebs cycle is coupled with the production of ATP. During this reaction GDP and an inorganic phosphate combine to create GTP and Coenzyme A is removed from the molecule to produce succinate. A phosphate group in GTP is then transferred to a ADP molecule to produce ATP. Succinate undergoes further oxidation by FAD and NAD to produce FADH2 and NADH and regenerate oxaloacetate. The two carbon dioxide molecules that are produced in the Krebs cycle are the two remaining carbons from glycolysis and are released as waste. Most of the energy produced in the Krebs cycle is in the form of electron carriers NADH and FADH2. The electron carriers, NADH and FADH2, created in the Krebs cycle diffuse through the mitochondrial intermembrane space to specific locations on the inner membrane of the mitochondrial membrane. On the inner membrane of the mitochondria are three membrane-bound protein complexes, NADH dehydrogenase, b-c1 complex and cytochrome oxidase, which make up the electron transport chain. The electron transport chain is a series of protein complexes embedded in the inner mitochondrial membrane that accept and donate electrons in a sequential series, resulting in oxidative phosphorylation. The electron transport chain begins with the donation of electrons to NADH dehydrogenase; these electrons are passed to a mobile carrier, ubiquinone (Q). Ubiquinone carries the electrons through the intermembrane to the second complex in the chain, b-c1 complex. The b-c1 complex can accept electron from both ubiquinone and FADH2, the b-c1 complex passes the electrons to a second mobile electron carrier in the intermembrane, cytochrome c. Cytochrome c passes the electrons to the third complex in the chain, cytochrome oxidase complex. When the electrons reach the cyctochrome oxidase complex, a molecular oxygen molecule (O2) acts as the final electron acceptor by combining with the electrons and four hydrogen atoms to create water. 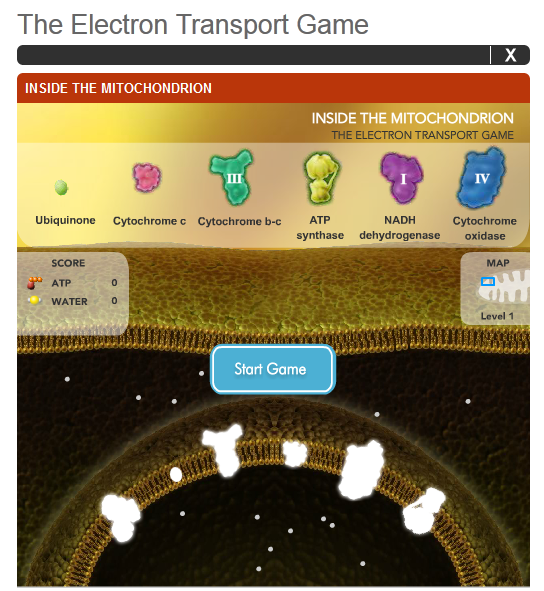 The electron transport chain also uses the electrons donated by the electron carriers to pump hydrogen atoms from the intermembrane space into the mitochondria matrix. This creates a chemical gradient within the mitochondria that is used to drive the production of ATP in a process called chemiosmosis. The protein complex ATP synthase to restrict the diffusion of hydrogen ions back into the intermembrane space, the energy produced is used to phosphorylate ADP into ATP. The amount of ATP in a cell remains constant during the life of an organism. The cell regulates the amount of ATP produced by feedback control mechanisms. The glycolysis pathway is controlled by the feedback mechanisms phosphofructokinase, an enzyme which converts fructose 6-phosphate to fructose 1,6-bisphosphate, through an allosteric binding site for ATP. When there is sufficient ATP in a cell, an ATP molecule binds to the allosteric site on phosphofructokinase and inhibits the enzyme, therefore inhibiting the glycolysis pathway. Phosphofructokinase also regulates the Krebs cycle, by inhibiting the reactions that take place after the formation of citrate, causing an increase in the amount of citrate in the cell. The Krebs cycle can be regulated by an excess of NADH. When an excess amount of NADH exists in a cell there is an inhibition of the enzyme pyruvate dehydrogenase, which is used to convert pyruvate into acetyl-CoA and carbon dioxide. Links to good test and quiz questions. Can be used for extra practice as well. Catabolic Pathway (Catabolism): The process of breaking down compounds into smaller molecules to release energy. Catalyst: A substance that increases the rate of a chemical reaction without itself undergoing any permanent chemical change. A substance that decrease activation energy. Aerobic Respiration: A catabolic pathway requires oxygen and converts glucose to carbon dioxide and energy. Pyruvate oxidation: Second stage of aerobic respiration, where pyruvate is transported from the cytoplasm to the mitochondria. Feedback Control Mechanism: A mechanism or a signal that initiates (or accelerates) or inhibits (or slows down) a process. Carter-Edwards et al.2008. McGraw-Hill Ryerson Biology 12. McGraw-Hill Ryerson. Fraser, Douglas, Barry LeDrew, and Angela Vavitsas.2008. Nelson Biology 12 University Preparation. Nelson Education Ltd.